The Maple Economy Display Case Arrangement allows you to purchase all of the essential pieces together to create a custom built-in unit, creating attractive displays, highlighting all of your best merchandise. This particular display case arrangement includes one of each of the following: 70"L Full Vision Display, Open Shelf Corner Filler, Well-Top Register Stand, and 48"L Service Counter. All display units are fully assembled when shipped. The full vision display case is made of a low pressure melamine laminate finish with tempered glass top, front and sides. Additionally, it features an easy sliding rear hardboard doors, and anodized aluminum frame extrusions. The corner shelf filler will tie all of your units together, while the register stand is capable of holding your store's most essential piece: the cash register or computer. 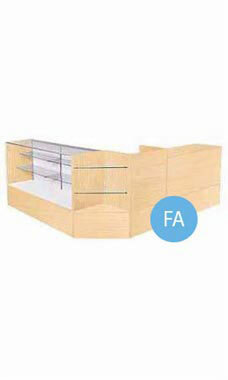 The 48" Service Counter has ample space for storage, so that you can efficiently provide quality customer service. Crating for secure shipping is included in the price of the case. Ships fully assembled.